27/09/2018 - Tax officials from 21 jurisdictions* met this week in Yangzhou, People's Republic of China, to share experiences from the first year of country-by-country reporting and explore how information can be used most effectively in the tax risk assessment of MNE groups. 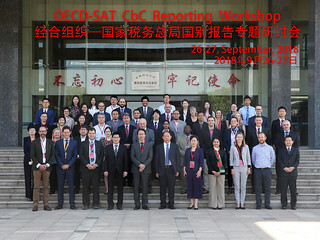 The workshop, organised jointly by the OECD and the Chinese State Administration of Taxes (SAT), also included representatives of large MNE groups headquartered or with major operations in China and the Asia-Pacific region. Country-by-country reporting, one of four minimum standards established by the OECD/G20 Base Erosion and Profit Shifting (BEPS) Project, provides tax administrations with unprecedented information on the global structure and activities of large MNE groups, as well as on where a group raises revenue, earns profit and pays tax. Currently, over 70 jurisdictions have implemented comprehensive rules to require the filing of this information by the parent entities in MNE groups with consolidated revenue of at least EUR 750 million in the previous year, with more jurisdictions in the process of implementing such a requirement. The joint workshop looked at different ways in which the information contained in a country-by-country report can be incorporated into improved tax risk assessment practices to give greater assurance to tax administrations and certainty to MNEs, including through the OECD International Compliance Assurance Programme (ICAP), which is currently piloting an approach to the joint risk assessment of MNEs. The workshop also considered lessons that can be learned from the implementation and operation of country-by-country reporting to date, from the perspective of jurisdictions and MNEs. Outcomes from these discussions will be incorporated into future work of the OECD/G20 Inclusive Framework on BEPS, including a review of the country-by-country reporting minimum standard, which will commence later this year for completion in 2020. Find out more about the OECD's work on Country-by-Country reporting. *Jurisdictions attending the event included Australia, Brazil, Canada, Germany, Hong Kong China, India, Indonesia, Italy, Japan, Kazakhstan, Korea, Luxembourg, Malaysia, Norway, Pakistan, People’s Republic of China, Russia, Singapore, South Africa, the United Kingdom and the United States.